Next time you are out shopping in the evening, pull your eyes from the window displays and take a moment to appreciate the glow coming from the buildings themselves. Building accent lighting has become a popular way to differentiate businesses, and add to their curb appeal. 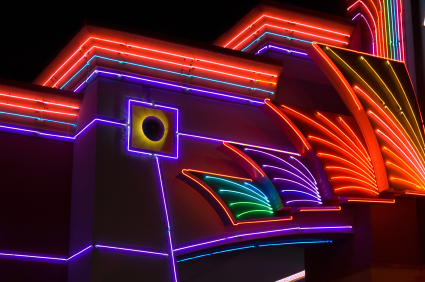 Whether this radiant lighting comes from classic neon or LEDs, many businesses designing new buildings or retrofitting an old one are adding this distinctive feature to their plans. “A whole range of businesses are incorporating border lighting. The focus these days is definitely on LED. 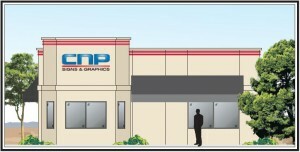 Architectural border lighting is ideal for retail, restaurants, casinos, theme parks – really any business that wants to attract customers after dark,” says Bob McCarter, VP Sales at CNP Signs & Graphics, a company with over 70 years in the sign business. Ease of installation, ruggedness, and operating efficiency remain in the new technology’s favor and mean the LEDs are here to stay, and their myriad uses and performance will only increase over time.